Thinking of tiling on to a gypsum, plywood or cement based substrate? Stop and think again! Multi-pro Tile Backer eliminates all the problems associated with tiling on to gypsum or plywood without having to overcome the handling / fixing inconveniences and the health risks encountered when working with cement based tile backer boards. No wonder more and more projects and stockists across the UK are moving over to Multi-pro Tile Backer. Do Resistant boards need to be hard fixed or can they be dot and dabbed? Resistant Building Products always recommend mechanically fixing the boards. In-house testing has been carried out using CT1 Grip & Grab adhesive, by fixing our boards back to timber and block, a suitable adhesion was achieved where the adhesive would only be suitable to offer a temporary fix. The adhesive could be used together with screws and nails for an extra strength fix. Please see our ‘Accessories Information Page’ & full MoistSure fitting guide for more detail. What fixings do I use? Stainless steel or minimum 12 micron galvanised fixings should be chosen at all times. Are Resistant boards backed by a Guarantee? 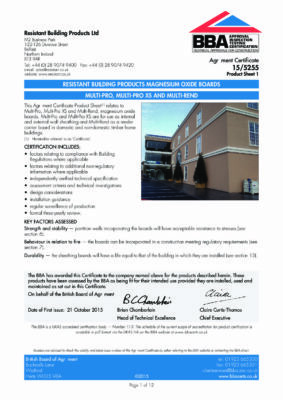 Multi-pro MoistSure is backed by a 25 year Guarantee & is also covered by a BBA certificate to have a life equal to that of the building it is installed. Can the boards be used in contact with damp and to prevent water ingress? No. Resistant boards will not deteriorate when in contact with moisture over prolonged periods but they are not designed to stop water ingress. The boards are breathable and allow the passage of moisture. Resistant boards will absorb moisture in damp conditions and release same when the ambient conditions allow. This process can be repeated continuously. What weight of tiles can Resistant Multi-pro MoistSure carry? Resistant boards have been proven in testing at Napier University to hold over 100kg/m2 of tile and tile adhesive weight on our 12mm Multi-pro MoistSure board. The full test report for this achievement is available upon request. Will the board support fittings? The boards will support light fittings only such as; toilet roll holders, shower curtain rails, small vanity mirrors, shelves, pictures etc. Appropriate fixings must be used along with rawl plugs. Other large fittings such as grab rails and cabinets must always be fitted into supporting studwork. Do Resistant boards require to be primed before applying tile adhesive? The requirement for a primer would be detailed by the tile adhesive manufacturer. Resistant boards have been extensively tested with market leading BAL tile adhesives and acrylic primer. During testing, the bond between tile adhesive and Resistant board was significantly strengthened when primer was applied. Tiles should be fixed to the rough side of the boards. What side of the board do I tile on to? MoistSure boards should be tiled onto the rough side. How are the boards cut? Very easily! By score and snap with a standard craft knife, Stanley blade and can be hand or machine sawn. We would recommend a saw with Tungsten Tipped Carbide blade. A video of the score & snap method can be found here. Do we have a pull-out test for screws? A series of our boards have been tested for pull-out strengths with Ejot, Sympafix and Rawlplug fasteners to name a few. These reports are available upon request.